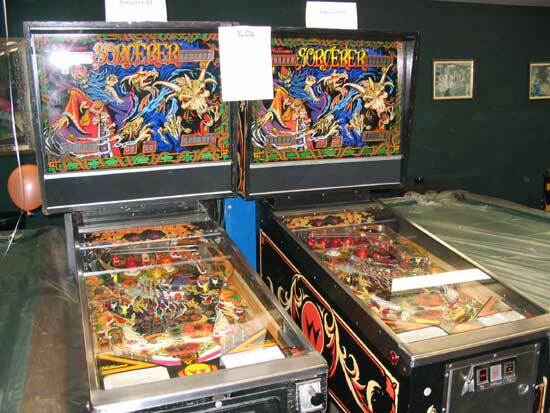 Pinball shows and parties are the lifeblood of the pinball community. The time and effort required to set-up, promote and run them far outweighs the financial rewards for all but the very largest shows, so where's the incentive? Hopefully, part of the reward is seeing so many people enjoying themselves and meeting friends old and new. 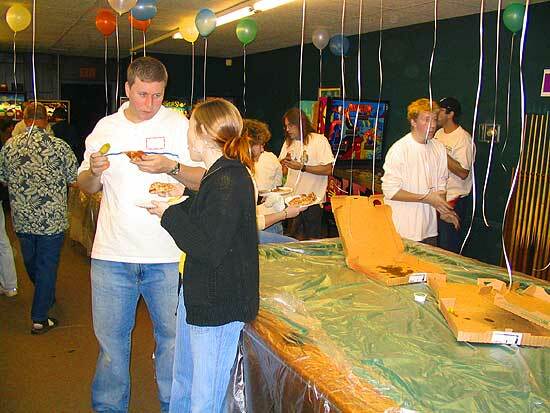 That was certainly the scene at SS Billiards on the night of 2nd October 2004 when owner Lloyd Olson held his first Pinball Circus party. 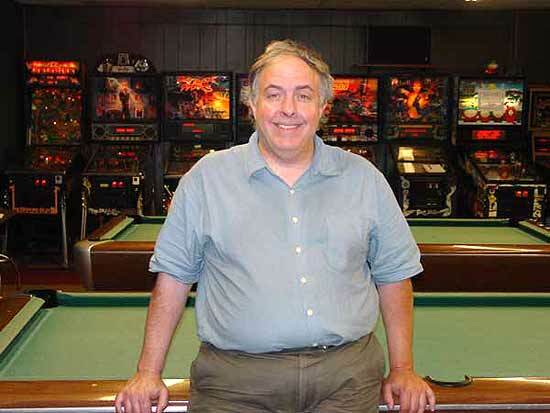 Lloyd is well know to Pinball News readers as host of previous pinball parties and one of the good guys. To him, pinball isn't a hobby, it's his livelihood. So this October we saw the new Pinball Circus party - an open event at SS Billiards running from noon to midnight with pizza provided and a $10 entrance fee. 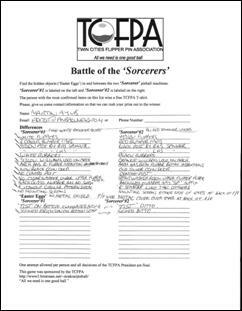 There were three competitions on the night - a high score tournament on the Lord of the Rings game, a knock-out tournament and a spot-the-difference held by the TCFPA on two Sorcerer games. They looked very similar but there were a number of differences and hidden "easter eggs" that needed to be spotted and written down. Banzai Run, Addams Family, Attack From Mars, Medieval Madness, Indianapolis 500, Pinball Magic, South Park, Eight Ball Deluxe - Limited Edition, Safecracker, Breakshot, Roadshow, Doodle Bug, Dracula (Stern), Stars (Stern), Big Bang Bar, Kingpin, Sorcerer x 2, Scared Stiff, Junkyard, High Speed, Black Hole, Judge Dredd, Demolition Man, Strikes & Spares, Baby Pac Man, Funhouse, Tales From The Crypt, Bram Stoker's Dracula, Tommy, Twilight Zone, Lord Of The Rings, No Good Gofers and Monster Bash. The tournament rounds consisted of head-to-head, best of three games. It started at 8pm and by 11pm the winner was Paul Madison who took home this rather splendid trophy and $100 cash. The Sorcerer competition was won by Troy A and the highest score on the Lord of the Rings came from Terry SC. There were also other prizes given away of Pinball Circus mugs and t-shirts. I must mention the amazing disappearing pizzas. There seemed to be a gap of mere nanoseconds between the regular cries of "Pizza's here!" and "Pizza's gone!" 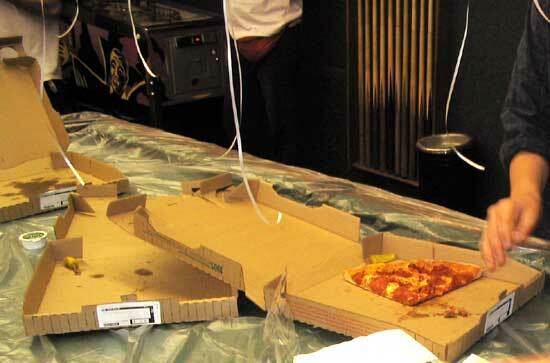 but equipped with a high speed shutter on the camera, here's a rare glimpse of the mysterious food from Papa John. Pinball Circus was a new variant of the well established goose-related themes and was hugely enjoyable for everyone attending. It was always busy without becoming too crowded and the smoke level seemed lower this year too. Even with the tournaments taking place, it was always possible to find a game to play, so a big thank you goes out to both Lloyd and those who helped out with their time and games. Hopefully, the circus will roll into town again soon. And now here's TCFPA President Todd "PinTed" Andersen with his review of the Sorcerer competition and the whole party day. SS Billiards had its first ‘Pinball Circus' on October 2nd, 2004 . With all of the space being taken up by the additional pinball machines and all of the people, SS Billiards really did seem like a circus. 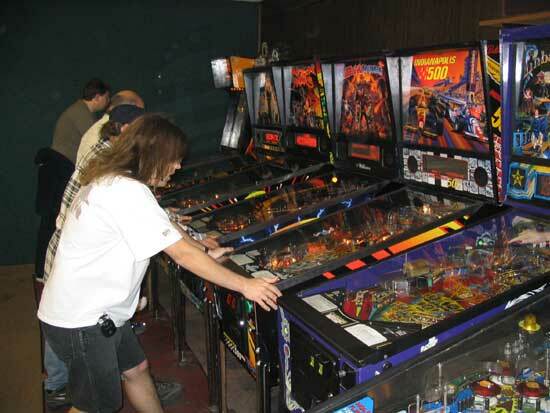 While at Pinball Circus, and for just $10.00, you could enjoy ‘free play' on all of the pinball machines. 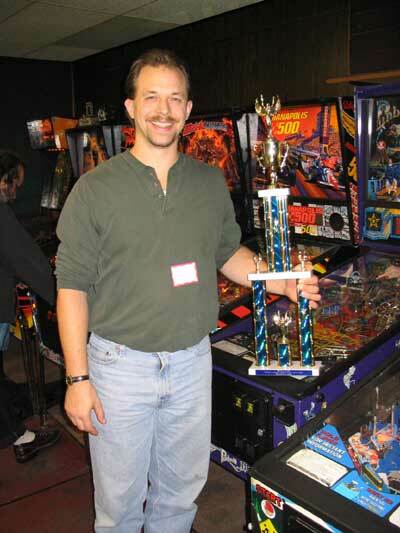 And, you could have tested your skill in the single elimination pinball tournament where you could have won a trophy and cash prize. There was no additional charge for: popcorn, pizza, pop, and balloons. A few other people contributed to the circus. Denise made batch after batch of fresh hot chocolate chip cookies. A few people brought pinball machines. 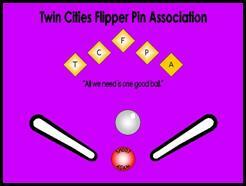 The TCFPA also brought a couple of pinball machines. One of which was a 1985 WMS ‘Sorcerer'. It was placed next to Lloyd's own ‘Sorcerer'. Why would the TCFPA bring in another Sorcerer you ask yourself? Well, the answer was to play pinball and another game. This other game was like the popular ‘Photo Hunt' game by Merit. The object of the game on the two juxtaposed Sorcerers was to find as many differences between and ‘Easter Eggs' on the two games. There were many differences between the games. Players were awarded 1 – point for each correct answer. No points were penalized for incorrect answers. For example, a few people listed that one machine was ‘taller' than the other. The correct answer (that none of the contestants got) was that one game had a longer set of legs. This would have been worth 1 – point. Notice the slightly longer ‘cabinet cruncher' legs mounted on the game on the left. The legs are famous for two things. One, they: gouge into the cabinet, make impressions, and remove decals or paint from the cabinet corners. Second, as they are longer, they give more of a mechanical advantage when force (nudging or moving) is applied to the game. This force is usually sufficient to warp the legs. Most people played both Sorcerers as they were intended. They played them as pinball machines. Six people, and myself, played the ‘Photo Hunt' type game. Just as many started playing the photo-game and ended up leaving their forms and taking my pens. For the record, though I participated in the game, I did NOT allow myself to be eligible for the prize - a TCFPA T-shirt. Martin was one of the players and has offered to host this online version of the game for those whom couldn't be there but my want to play at home. I have to admit that we had some sharp observers. Both pinball machines were in two different rooms while I was working on them. But, I had them in my possession for about a month. And I never even realized all of the differences. 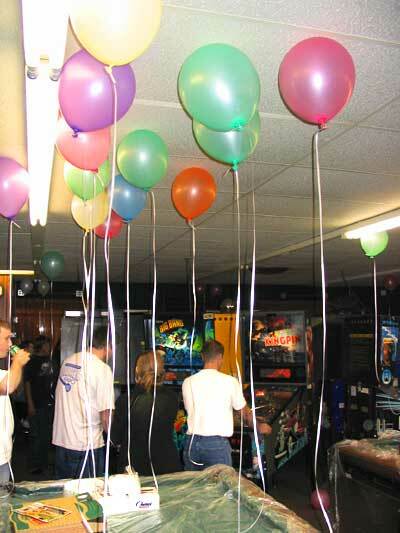 I originally played the photo-game after my wife suggested it as an event for Pinball Circus, 2004. I missed the differences in the Sorcerer characters on the PF, but many of the players did not. Because players gained a point for each difference, each specific difference was awarded a point. Notice that the upper PF Sorcerers are different. Then specifically notice the differences in coloration between the capes and their trim. Also notice the different colored: flippers, post rubbers, and PF rubbers. If you got all of these, you would have earned 6 – points. The different pop bumper caps are easily spotted. But did you see the white light hood in the picture on the left? 2 – more points. The spinner on the left is blue / white. The one on the right is blue / yellow. But, did you notice the different configurations of the post rubbers? These differences were worth 2 – more points. Notice the visible hardware on the ‘eyes' on the right. The eyes on the left are looking up at the player while the eyes on the right are looking out at the game being played. Notice the stones of the wall on the left are more orange than their yellow counterpart's. And, look above at the different PF glass channels. That's another 4 – points. One game had replacement stand-up targets. The other had all-original targets and a clear ‘fender' washer to keep the plastic from breaking, like the other. These differences constitute 2 – more points. The kicker on the left has a nice color matching plastic washer protecting the plastic's front corner and a metal washer protecting the plastic in the back corner. The kicker on the right has two metal washers protecting the plastic. These differences make 1 – little point. Not worth a point but worth mentioning, notice how the washers go next to the post NOT the plastic. The playfield plastics on the left are darker and have a different number than the ones on the right. Again, 2 – points. Notice the two different PF aprons. The one on the left only has the instructions on its right side. And, notice the different coloring and lines of the WMS Logos. Did you notice that the game on the left has no ‘Second Chance' post? The apron rubber, for the PF glass, was not visible with the lockdown bar installed. There were still 5 – points available. There are no pictures for these next few difficult to determine differences. And, you would have had to play the games to find them. The first, on the game on the right, coil(s) would momentarily energize during startup. Secondly, on the same game, if a game started just after the preceding game finished, the background sounds would some times not start back up until the first ball drained. And lastly, to fix the first two problems, the light show was decreased to make room in the software for the corrections. These were 3 – very hard to find points. But, a few people did notice the difference in the light shows. The GI on the game on the left had a homemade GI control relay kit. The relay was unplugged to simulate a power board without this kit. This made the GI stay constantly lit on this game. The game on the right had a ‘black out' effect. Noticing this was worth 1 – easy to find point. I was a little surprised that no one but me noticed the glass on the left was darker. But again, the game was played in a darkened arcade. This was worth 1 – little point. But, they added up. I am nearing the end of this section. This is where we started, the front of the machines. Go back and reexamine one of the first sets of pictures. Look at the set with the coin doors. Notice the two different coin-doors. The door on the left has the same stickers on the coin slots with two coin returns. But the door on the right has two different stickers with only one coin return. This makes 3 – points. Finally, the reason for all of the differences. The game on the left is SN: 532 – 57275. The game on the right is SN: 532 – 20041. The prefix denotes the model number. Though ‘Williams' has always been secretive with their serial numbers, the suffix denotes that this was probably the 41st production game. The first ten to twenty prototype games had even more backglass differences. You can check the “Easter egg” section below and the IPDB. Notice the differently numbered and colored playfields. But, the signature is one Easter egg. This makes 3 – possible points. Look at the star in between the three pop bumpers. Isn't that a pinball? 1 – point. These signatures (Easter egg) and numbers (difference) were worth 3 – points because the winner was clever enough to realize that the glasses had been switched on the two games. Look at all of the hidden things on the back glass. To start with, there is a playful little demon in the ‘O' of the game name. Hidden in shadow are a: bat, snake, dragon, pile of human skulls, and few mushrooms. The last hidden egg on the backglass is the mirrored eyes of the largest dragon. In his eyes, you see yourself looking at him. All of these hidden things were worth 7 – big points. Finally my favorite, go back and look at the pictures of the aprons. The flippers make the lashing ‘tongues' of the dragons. This is worth 1 – cool point. I know that playing this version of the game is not the same as actually being there. So, don't bother trying to add up all of your points from this online version. The average number if items spotted by the six participations at ‘Pinball Circus' was seventeen. The maximum numbers of things that the players and I found were fifty. View the spreadsheet to see all of the information. I have also included this graph for those of you who like a quick summary. From the chart and graph you can see that Troy won! He found thirty-one objects. Amazingly, he scored sixty-two percent. Considering the circumstances under which he competed, this was an incredible observational feat. With limited time, Troy played the photo-game: in a darkened arcade, while other people were playing the games as pinball machines, and all while watching his kids. Troy won his choice from three TCFPA T-Shirts. TCFPA Logo T-shirt with this small logo on front and larger version on back. TCFPA Plaque T-shirt with a small TCFPA logo on front and this plaque design on back. TCFPA PF T-shirt with a small TCFPA logo on front and this PF design on back. Troy chose this ever-popular TCFPA PF shirt. He wears it proudly on league nights. You could have a chance to win your own official TCFPA T-shirt on February 12th, 2005. 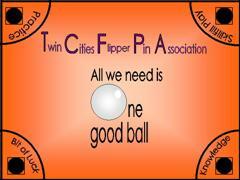 On that Saturday, the TCFPA will be having its 2nd annual year-end tournaments. The tournaments will be at Lloyds again. We hope to run the tournaments like we did last year. Lloyd didn't expect loosing money and he didn't see this as a problem. I knew that with: the prizes of mugs and shirts, the trophy, the $100.00 cash prize, all of the rounds of pizza, and the cases of pop; Lloyd didn't make any profits. But, on the bright side, he did host a great party. See the Diary section for the 2005 dates for Pinball Circus.